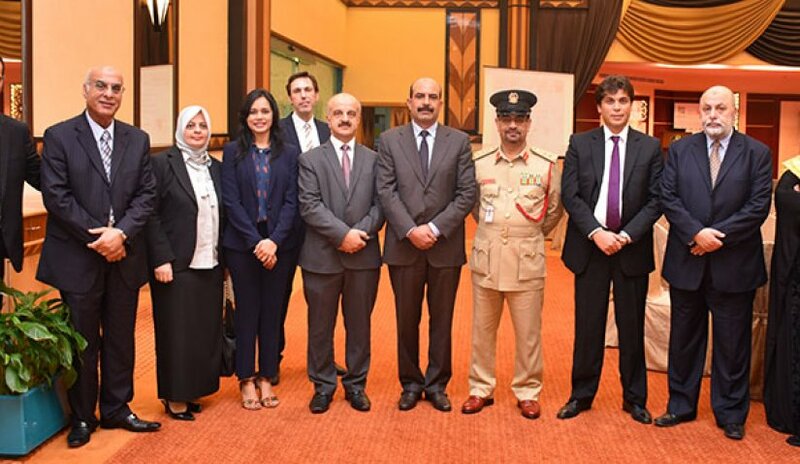 Major General Mohamed Saad al-Sharif briefed the audiences on the importance of promoting the safe use of social media communication. He explained that security is a major pillar of development. For the attainment of this clause the establishment intends to focus conscious efforts in how to use social networking sites safely because this will have a great impact on society. He also outlined the role of universities, schools and institutions in raising awareness among young people in society. The Vice President of Academic Affairs, Dr. Samir Barghouthi expressed his gratitude upon the collaboration of Al Falah University with Dubai Police. He honored the valuable members of Dubai Police in their commitment to the community to create a climate of stability and security. Dr. Barghouthi elaborated the role that Al Falah University intends to play in bringing about direct communication between Dubai Police and the community. The University will make efforts to raise awareness in the community through positive messages through the university website and means of social communication. The ceremony included several thought provoking events, including a play presentation on abuse of social media, such as a waste of time and a violation of the privacy of others. The event was concluded by an appreciation where Major General Mohamed Saad al-Sharif presented a shield to Dr. Sameer Barghouthi for the active participation of AFU in this campaign.